One of my favorite things to do, especially at the beginning of the year, is getting myself all organized. From my closet to my desk at work, I love taking a few minutes (or more) to clean up and clear everything out. After helping Cassie organize her Goodreads account and noticing some questions about it on Twitter, I've some tips that will hopefully help if you're resolved to get Goodreads in order. 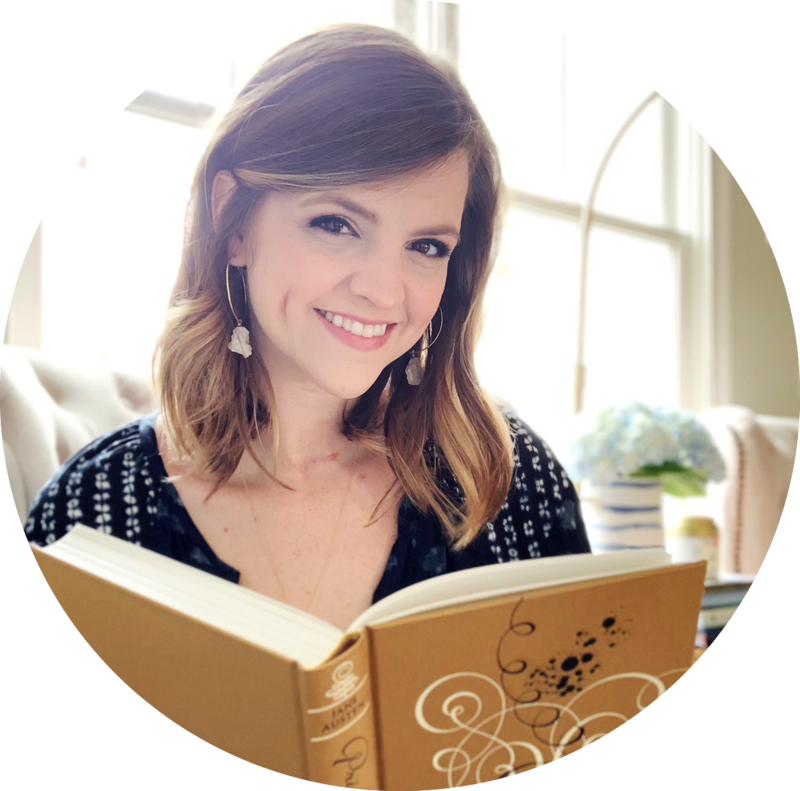 Here are ten things you can do to get organized on Goodreads - followed by step-by-step instructions showing you exactly how to make some of the changes I've mentioned. Tips that correspond with instructions below are noted with (See Below) at the end. From the My Books page, look at the bottom of the left-hand sidebar where your shelves are listed and click "Find Duplicates." It's a quick way to find out if you've got multiple versions of one book on your shelves so that you can get rid of the duplicates. Who Gave It To You: Kindle, Library, NetGalley, etc. What Genre It Is: Historical, Contemporary, Fantasy, etc. When You Read It: Read in 2013, Read in 2014, etc. Where It's At In The Bookstore: Adult Fiction, Young Adult Fiction, Non-Fiction, etc. Why You Read It: Strong Heroines, Diversity, Series To Finish, etc. How You Felt About It: Did Not Finish, Favorites, etc. If you previously shelved books incorrectly, move them around. Glance at your "Currently Reading" shelf. Is it up-to-date? Check and make sure! Set your shelves to sort by your preference. For me, it's alphabetical by the author's last name. 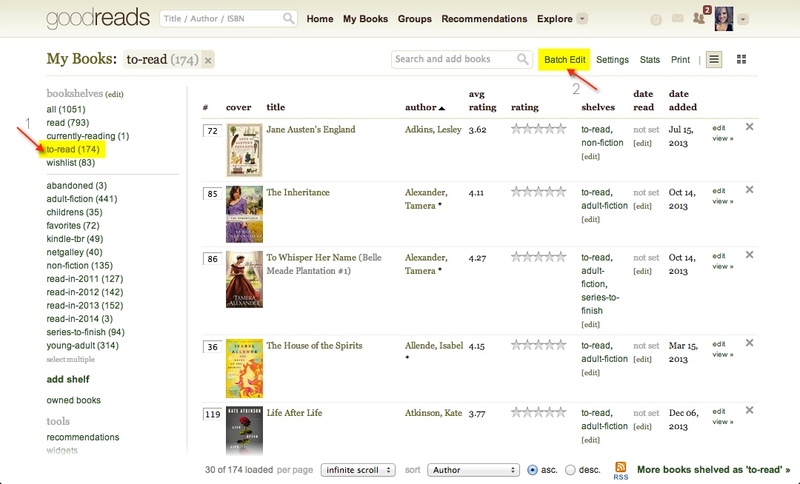 But you could have it sort by the date you added it to your shelves, title, average Goodreads rating, etc. Those are a few things that I think can make a huge difference. With that - here's how to do some of the things I've mentioned! And let me know if you've got questions that I can help answer. First of all, consider hiding your activity updates if you're planning on making a significant number of updates to your account. I know some bloggers who worry about spamming their friends and followers with a ton of updates, but there's a quick change you can make to solve that problem. 1. Select "Edit Profile" from the drop-down menu next to your profile picture. 2. Click on the "Feeds" tab. 3. If you temporarily want to hide all activity, uncheck every box. 4. Click "Save Feed Settings." Once you're done making organizational changes, just repeat steps 1-2 and then check the boxes for all the activity you want your followers to be able to see again. 1. 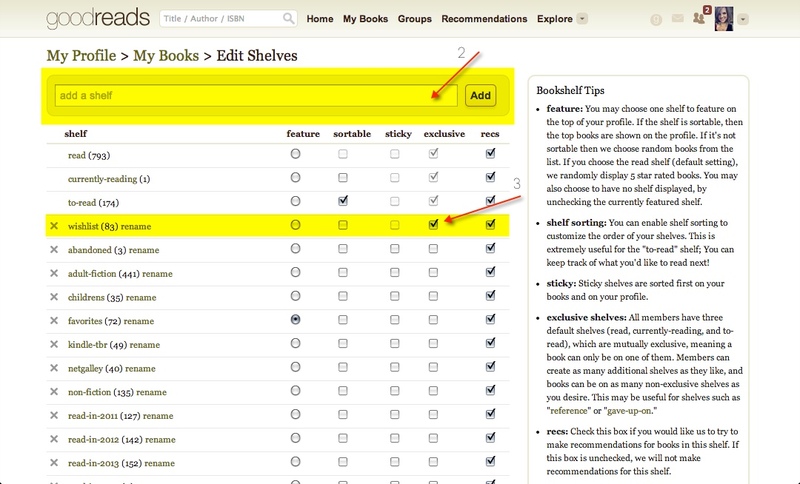 From the "My Books" page, select the shelf you'd like to edit. For example, I'm editing my "To Read" shelf. 2. Click "Batch Edit" to begin making changes. 3. Select all of the books that you'd like to remove (delete) from your shelves completely. For example, these could be books you were interested in at one time and no longer want to read. 4. Click the gray "Remove Books" button. The page should refresh and will tell you how many books you've now removed from your shelves, which you'll also see reflected in the number next to the shelf name. 1 - 2. Follow steps one and two in the previous instructions on how to delete books. 3. Similarly to step three in previous instructions, select the books you'd like to move. This time, you'll be shifting them from one shelf to another - not getting rid of them completely. 4. Once you've selected the books you want to move, choose the shelf you'd like to move them to from the drop-down menu at the top. 5. If you're adding books to a shelf, click "Add Selected." The books you selected will now be added to the shelf you selected from the drop-down menu. *This doesn't work if you're trying to remove the books from your account completely. It only removes a book from shelves you've created (like "Read in 2013"), not from default shelves (like "To Read"). See previous instructions on how to delete books if that's what you want to do. This is also how you can easily move books from one shelf to another. Let's say you accidentally added 5 books to your "Young Adult" shelf instead of "Adult" shelf. Just select the 5 books you want to move, choose "Adult" from the drop-down menu and click "Add Selected." With the same books still selected, choose "Young Adult" from the drop-down menu and click "Remove Selected" to take those books off that shelf. That's it! Now your books are exactly where you want them. Moving books from one exclusive shelf to another is even easier. If you marked books as "To Read" instead of "Read," it's simple to update them all at once. Select the books, select "Read" from the drop-down menu and click "Add Selected." The end! Since books can't be on more than one exclusive shelf, you don't have to remove them from "To Read." They're automatically removed when you switched them to "Read." One thing I've never liked about Goodreads is that all of the books you want to read are automatically added to your "To Read" shelf. Why don't I like it? Because I want to know what you actually own to read versus want to read. I can't tell you the number of times I've gone to look up a book on Goodreads to see if a blogger friend has it only to find it shelved on "To Read." WHAT DOES THAT MEAN? I want to know if I can buy it for them, but Goodreads isn't telling me with that shelf designation! The three default exclusive shelves are "Read," "Currently Reading," and "To Read." These three are mutually exclusive, which means that a book can only be one of them at a time. It's SO easy to create additional exclusive shelves - like "Wishlist." Here's how! 1. From the "My Books" page, select "Edit" next to "Bookshelves." 2. If you haven't already created the shelf, type the name in the white box and click "Add." 3. Check the box in the exclusive column! Now, you've got a new exclusive shelf. 4. (Not Shown) Click the "I'm Done!" button at the bottom to save your changes. While it's not for everyone, I would love it if more people started separating their wishlist from their TBR. Both are books you want to read, but they're not exactly the same thing. The reason I find "Wishlist" better as an exclusive shelf (versus adding a book to "To Read" and then adding to a non-exclusive "Wishlist" shelf) is that it's so much less time and work shelve a book in one place. Not everyone updates their Goodreads frequently, and it's easy for a book to remain on your non-exclusive wishlist shelf indefinitely unless you remember to remove it. Yes, you'll still have to move a book from "Wishlist" to "To Read" - but Goodreads won't let it be both places if you've made the shelf exclusive so it's not as difficult to keep it current. You've created your new exclusive shelf (steps 1 - 4) and now you want to add some books to it! 5. Whether you're on the book's page or browsing from search results, click the books portion of the green icon either next to the book's information. 6. Select where you want the books to be shelved - "Wishlist" in this example. Well, those are a few easy ways to get organized on Goodreads. Hope that helps, but let me know if you've got questions! THANK YOU FOR TELLING US HOW TO NOT SPAM EVERYONE! Ahem. Thank you. (With as much enthusiasm): Thank you for showing us how to organize in batches! (Shock and awe) TBR vs Wishlist = Brilliant. Seriously all of that is amazingly helpful. Though, looking at my comment, I am definitely a child. Sigh. Oh well. OH MAN! I need to do this!! I always have the goal of trying to organize everything at the start of a new, but i just never happens. :( Maybe if I AT LEAST organize my goodreads I can feel organized about SOMETHING going into the new year. At this point I only have 4 shelves--- READ, TO BE READ, BABY BETTYS, MR. BETTY. hahaa So you can imagine the giant mess I've created. It'll take time to sort through, but I'm definitely going to use your little guide. Thanks Hannah! How awesome are YOU!? pretty awesome! thank you for posting this. I've need a tiddyup for awhile on good reads. Thank you so much for this easy to follow tutorial! I've been wanting to clean up my to-read shelf for awhile, but wasn't a fan of going through one by one and deleting them. Seeing this has made it so much simpler. high-five for organizing! haha, one of my favorite things to do is going through my music and fix tags/add track numbers, album titles, etc. A few months ago I went through my To Read list and got rid of HUNDREDS of books. In doing so I noticed a huge flaw on GR's part: after doing a batch edit it doesn't automatically refresh. I'm not sure if they've changed it since then, but it was something that really stuck out for me and would have made not only editing such a huge amount of books much smoother and also drastically cut down on the time I spent. In addition to the To Read shelf I also have an ARCs to Read & Review shelf as well as subshelves for the time period/genre/year I read it/publisher/etc. The publisher shelves are a relatively new addition but I'm loving them so far. I read lots of books but lots of publishers, but once I added those shelves I realized I consistently give higher ratings to certain presses/imprints - when it comes to requesting review copies (or even browsing bookshelves) there's a good chance I'll enjoy a book if so-and-so published it. This is amazing and awesome. Thank you so much for taking the time to do this. This is seriously awesome. This is amazing!!!! I went through my Goodreads and subdivided my TBR into series books (both ones to try and ones to finish) but I didn't know how to not spam my updates......ooooooops ;). I'll remember that for next time!!!! Well, this is pretty helpful because I was a little confused about some of the features such at the batch edit one. I recently made exclusive shelves about books I intend to finish but abandoned in the middle because I felt bad for all those books in my currently reading shelf that I've yet to read. I also like the function of sticky shelves which basically brings whichever one of the non-exclusive shelves you choose to be at the top. It helps because I can go to it easily. You know I'm obsessed (punnnnn) with this post bc I need help! So thank you thank you thank youuuuu. I just wanted to add another thing I did for my Goodreads a while ago in hopes to solve a problem (however my shelves were too far a mess for this to really help). If anyone else has the problem, like I do, where they might hear of a book or see something and don't have time to check out reviews/read what it's about but want to REMEMBER it, I added an exclusive shelf called "to check out". Because I found myself adding SO many books "to read" just to keep them for reference/to check them out later etc. and then never went back and they've cluttered up my "to read". Making a "to check out" shelf that is EXCLUSIVE (read: doesn't show up in your to read shelf) makes it easier for me to go back and decide whether or not this books looks like something I want to read or not and then from there I can delete it or add it to my "to read" shelf. Now that I'm cleaning up my shelves like a boss thanks to your guide I'm hoping this exclusive shelf will also help me from getting messy again with the clicking "to read" just because I want to check back later on a book. OOOOOH. So I'm in the trenches right now and I'm overwhelmed already because of the above where I said a lot of these books were books I added to check out later and I have no idea WHAT they are about some of them. My initial strategy to get stuff off my list was go through all the things I don't, even at a glance know I want to read, with the batch and then delete those. THEN I was going to have to go through everything that I needed to "check out" but I kept getting overwhelmed with it taking so long to clear my shelves and I'm just moving everything I have no idea what it is/not sure I want to read it over to TO CHECK OUT and then after today I can just tackle 10 a day or something managable like that. Probably you guys are smarter than me and figured out something like this but I thought I'd share! This way I have the instant gratification of having a more managable "to read" list but can still decide if I am still interested in some of these books or not and they can be out of the way so to speak in an exclusive shelf! I love this and I am saving it to reference. I've been slowly trying to make my Goodreads more usable. 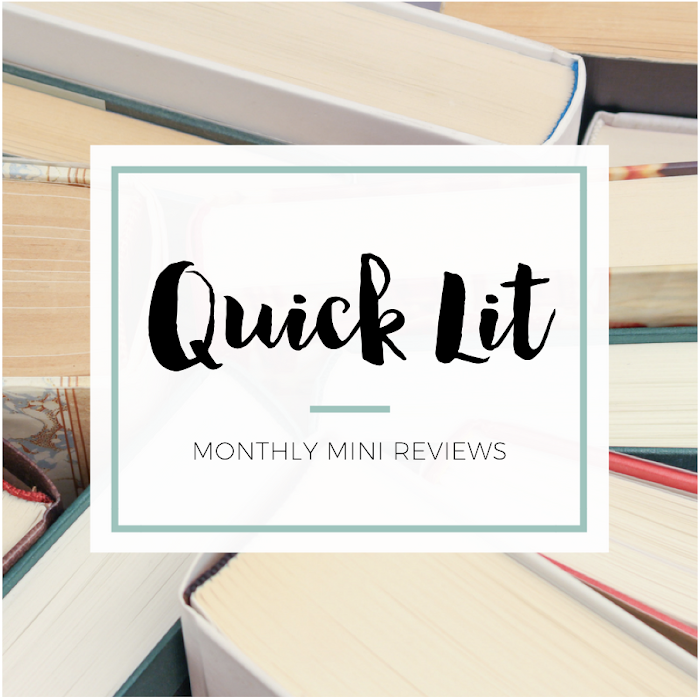 I did a big clean out to my TBR list recently, but I know I have to go back and be more aggressive with it. And knowing how to temporarily hide updates a great tip. Thank you! Thank you! This is the best! After I saw this I've spent my afternoon organizing my GR shelves. And it was high time too, haha. I use Goodreads 24/7, so I'm pretty good with all the stuff you mentioned...but it's AWESOME that you posted this, because I know that there are so so so many people out there who have no clue what they're doing with Goodreads and now hopefully they will all ready your post and fix it! Because, seriously, everybody should use Goodreads like this. I am LOVING this post, Hannah! While I've been primarily focused on organizing my blogging/reading life (which I'm posting about at some point, I think), I have been thinking about redoing my Goodreads shelves as well. Your post couldn't have come at a better time! I can't wait to get down and dirty and FIX THOSE SHELVES. I'll certainly keep you posted on any progress I make as of today. Seriously, you're awesome. I look forward to more posts like this to come! I recently did a major re-organization on GoodReads and these are such great tips if people aren't super familiar with how to best make use of the site. I LOVE that you also separate books you own to read vs. wishlist to read. I did essentially the same thing, but approached it slightly differently -- the new exclusive shelf I added was an "Own to read" shelf and I left the default "To Read" shelf as my wishlist. I find this works better for me because I am more often adding books to my wishlist than I am adding new books that I've acquired (or at least that is the way it should be!) 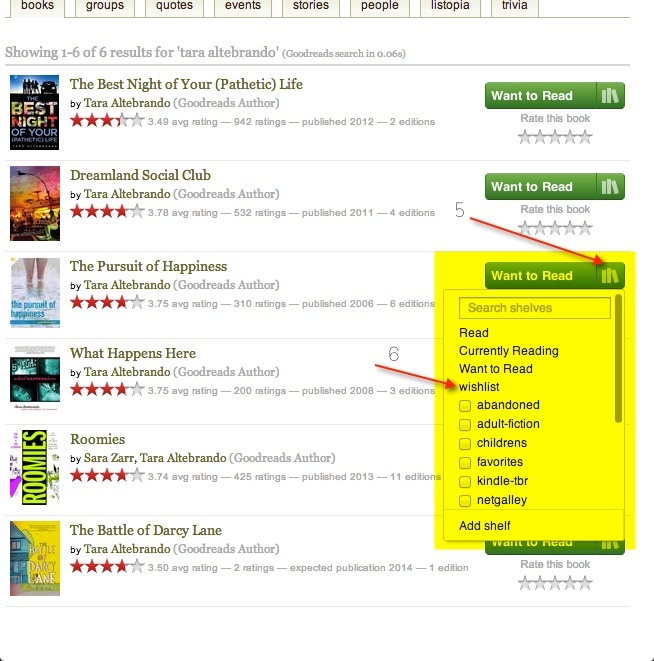 -- then when I spot a new book from a review or just browsing around, I can still just click on the giant green default "want to read" button without searching the drop down for the correct shelf. I go searching for that shelf when yet another package arrives on my doorstep though, LOL Obviously either way works, but I find that's the best for me. Oh! The other thing I love to use GR for is to shelve books for the (way too many) challenges I've joined for the year -- they are mostly by genre, so it does double duty of better categorizing my collection and also letting me see at a glance which books work for each challenge and which ones cross over to multiple challenges. I'm a total challenge junkie, but I love how organized my shelves are now that I took the time to do this. Huh! I had no idea you could add another 'exclusive' shelf! I've had a 'TBR' shelf, a 'wish-list' shelf and an 'own' shelf for a long time, but, I agree, an exclusive wishlist shelf would be nice! Because it's pretty self-explanatory that a wishlist book is also a to-read book, isn't it?! ;) Plus, it makes me overwhelmed to see how many books are in the to-read shelf, even though a lot of those I do not own. THIS. Just, yes. You know you're the reason I cleaned up my Goodreads! And without you I would have been trying to remove one by one!!! THANK U FOR ORGANIZING ME. LOVE THIS POST!!! I've been on GR a very long time but my shelves have always been a disaster because it's a combination of me forgetting GR exists/being lazy. Hopefully this will FINALLY make my shelves less of a mess. I appreciate how detailed you were with this. Thanks so much, Hannah! I actually do something like this a few times a year, usually right after I go nuts on a book-adding spree. I'm constantly rethinking my non-exclusive shelves, though, and can never quite decide on how much or how little to tag books with. I tend to add books to a few favorite specific shelves marked with whatever I get a craving to read (like books with shifters, robots, parallel universe, etc) in addition to the main genre shelves. I love having shelves for what year I read a book, and what my favorites were of a particular year. I've also started shelving books according to setting, for a few specific places around the world I'm particularly fond of. I hadn't thought of making my wishlist shelves exclusive, but I may implement that soon! I usually designated books I already have with an "owned" shelf, but I do like the idea of an exclusive wishlist shelf better. It seems more tidy. 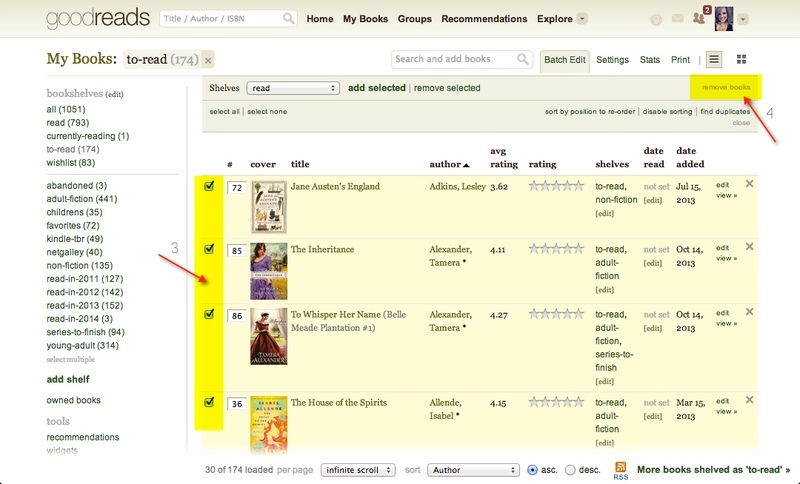 This is a great thing to bring to Goodreads users' attention. Thanks so much for sharing! I just did a purge of my Goodreads shelf and it always makes me laugh going back through them and finding some strange books that end up on there. Definitely need to go in and clean it out more than once a year! Making my wishlist an exclusive shelf has been a huge organization tactic for me. Helps me when I go to look for a new book only to realize I don't actually have it. Great post! I never officially commented, but this post is the bomb diggity! I used it a while back to organize my shelves and I just love it. Especially changing my to-read-self to a wishlist-shelf (or splitting them up. Idk how to put it.) was great, because separating the books I would like to read one day and the books I WANT TO READ NOW PLEASE is really useful. Yeah. My comment is very useless, but I loved your tips. This is great. Kthxbye. oh thank you, i've been wanting to do this forever, but it seemed so daunting! I have been trying to add a 'favorite's bookshelf' on my profile like everyone else has where the book covers show on your profile but I've tried everything and I cannot get it to pop up. It just keeps on showing me the regular '___'s bookshelves' but I cannot see the covers of my featured books. Help, please! 1. Make sure you've already created a "Favorites" shelf with some books on it. 2. Click the "My Books" tab at the top of Goodreads. 3. Click "Edit" next to "Bookshelves" in the lefthand column. 4. Find your favorite shelf, and select the bubble to the right in the "Feature" column. 5. Click "I'm Done" to save your changes. Thanks for the Goodreads cleanup info! 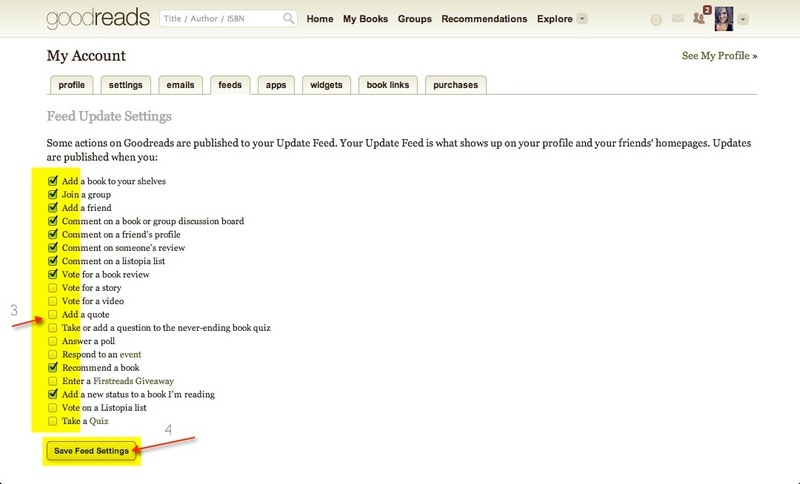 I was wondering if you know how to 'Like' a list on Goodreads. In my profile it says I don't like any lists yet. When I go to a list I do like I can't see any way to 'like' it. So if you are at a book list....go to the very bottom of the list and there is a button "like" and that is how you like a list. Hope it helps. Cheers. This is such fabulous advice and I just love all the things that you have mentioned here. I love goodreads, but I have been looking for ways to organize it better and this has helped me so much. I do need to seperate my wishlist from my TBR list. Do you use the wishlist for the "to read" option or do you make a separate shelf for it? Trying to decide which would be easier to do. Great advice on blocking updates, because sometimes I will go in and add a bunch of books and I feel like I am overwhelming my friends hehe so this sounds fabulous. I definitely am planning on working on organizing my shelves now thanks to you!! Thanks for the great article here. Wow- This is a great article! My only issue is I have 1,057 on my To-Read shelf, and I own MAYBE 20. Maybe. So basically I would just be switching shelves, and it would be hours of work. Right now I'm trying to start reading more that is on my To-Read list, and maybe clear some of it out. Would wishlist simply be a list for the books I want to read most? I'm so late to reply to this question, so I apologize! But you could easily create an exclusive shelf that's called "TBR" or "Owned Books" and move the 20 or so books that you own from your To-Read shelf to that one. Then, your "To-Read Shelf" can just have the 1,000 or so books you're interested in potentially reading one day. For me, "Wishlist" is the books I'd like to buy - but it could also be the books you most want to read! hey. I got one issue on GR.. is there any way that, while scrolling down any shelf (fantasy, for example), GR only showed me the books I "want to read" (i.e. those that are already on 'my books')? I don't want other Harry Potter books to be seen, because I haven't added other than the first one yet.. I agree - very helpful article. 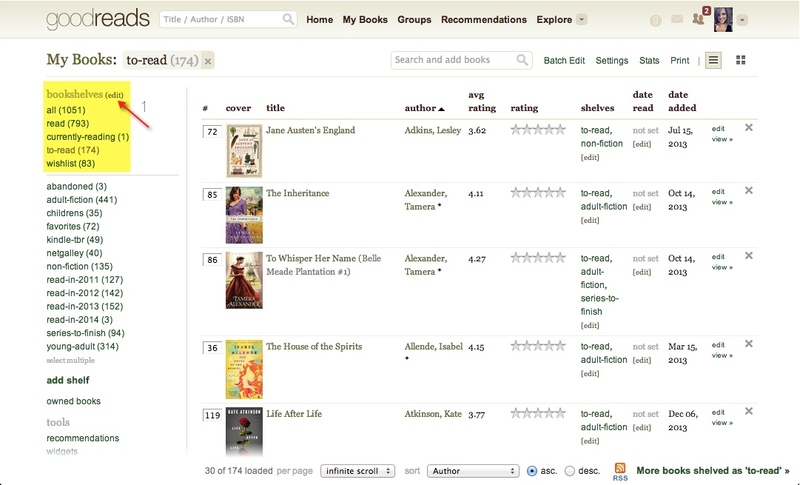 It would be even more helpful if GoodReads allowed me to "rate" the books in the order I'd like to read them. WishList will help because I'll put the books I'm most interested on it. But, you're right again, that sorting a thousand titles by hand takes HOURS. Sorry for the very late reply, but Goodreads does have the functionality that basically allows you to "rate" books in the order you'd like to read them. 1. Go to the shelf you want to sort - Want to Read, Read, etc. 2. 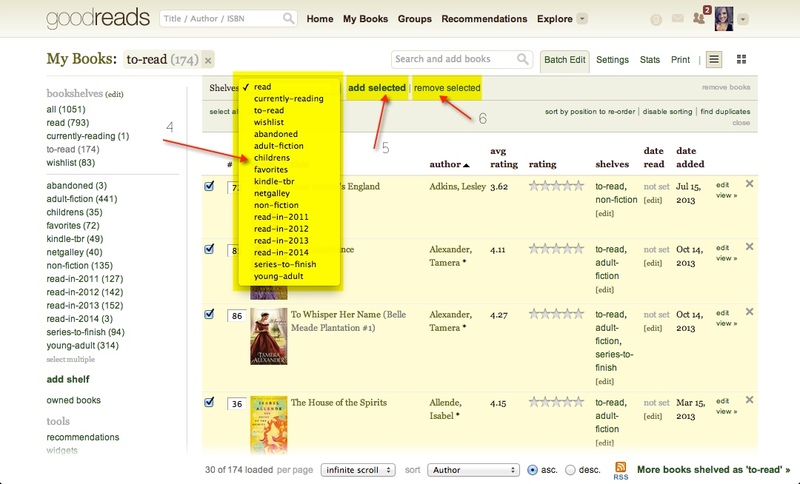 Click "Batch Edit" in the menu right above the list of books (to the right of the small search bar - not the one at the very top of the page). 3. In the second row of options, click "Enable Sorting." I believe this feature should already be enabled on your "Want to Read" shelf, but you can turn it on if it's not. 4. Then, you'll see numbers appear to the left of the book cover on your list. 5. 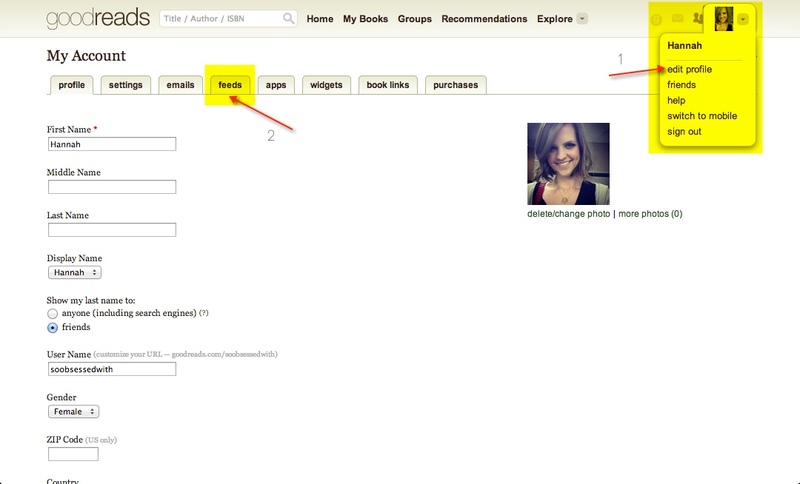 You can then assign a number to the books on your list based on the order you want to read them. 6. You can then sort that shelf by the number you've assigned it, in addition to the other ways you can sort a shelf (Author, Date Added, Rating, etc.). Hope that helps, but let me know if you have additional questions! THANK YOU for the inspiring idea of separating your TBR shelf into a wishlist shelf! That is such a genius idea and I can't wait to play around with my goodreads shelves now! This is such an amazingly thorough post, so many great ideas.